When a water loss happens at your residential or commercial property, it is important to act quick and get a mitigation company out. 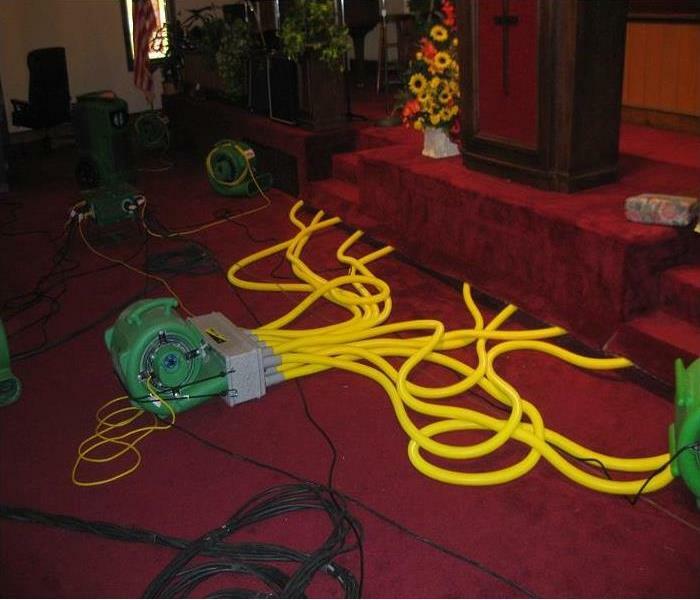 SERVPRO of Stone Mountain/Clarkston was called to this church that had suffered a water loss. 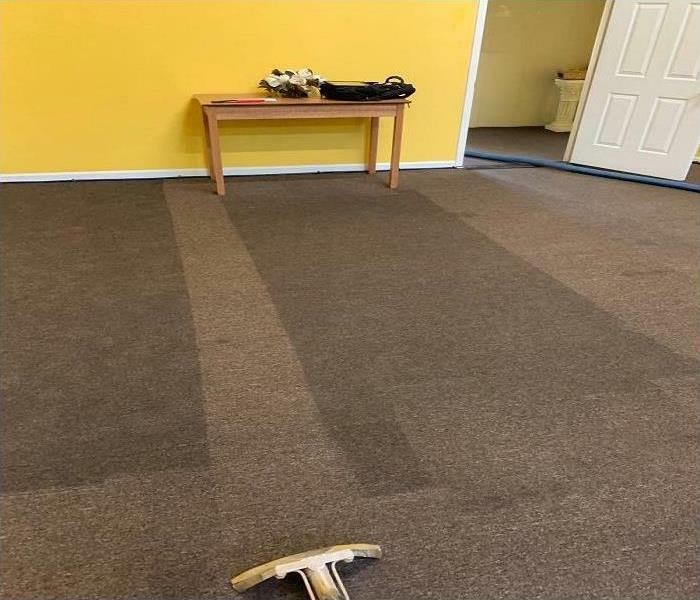 The picture you see is where the water is standing in the carpet and the lighter part of the carpet is a strip where we started to extract that standing water. Because of our quick response, we were able to save their glue down carpet. 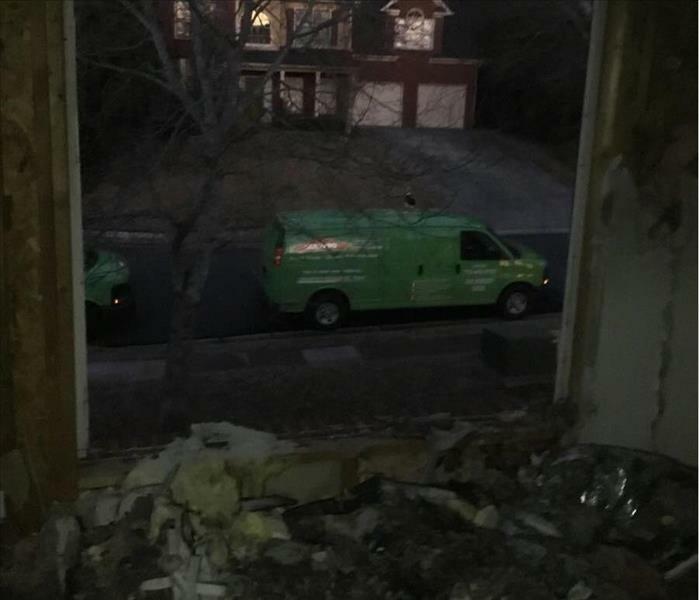 SERVPRO of Stone Mountain/Clarkston was called out to this business on a Saturday at 12pm. They had a backline from a sprinkler system discharge and needed help fast. They were set to open at 4pm. We gathered all our crews and sent them over to clean up. They were able to open and be back in business with no interruption. At SERVPRO of Stone Mountain/Clarkston, we work closely together between the office and the field. 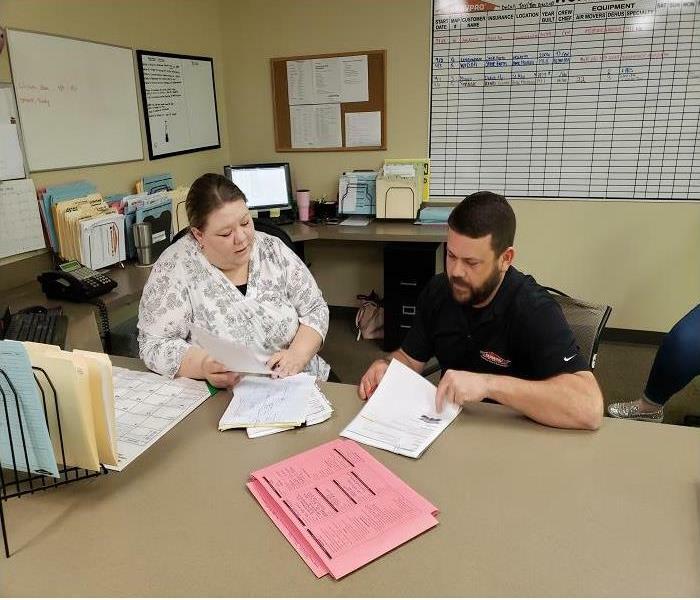 Our technicians and office personnel meet each morning to go over active files and make sure that we are both communicating with the homeowner during their mitigation process. SERVPRO of Stone Mountain/Clarkston's team is always working. Whether it be out on a mitigation or remediation job or in our office. 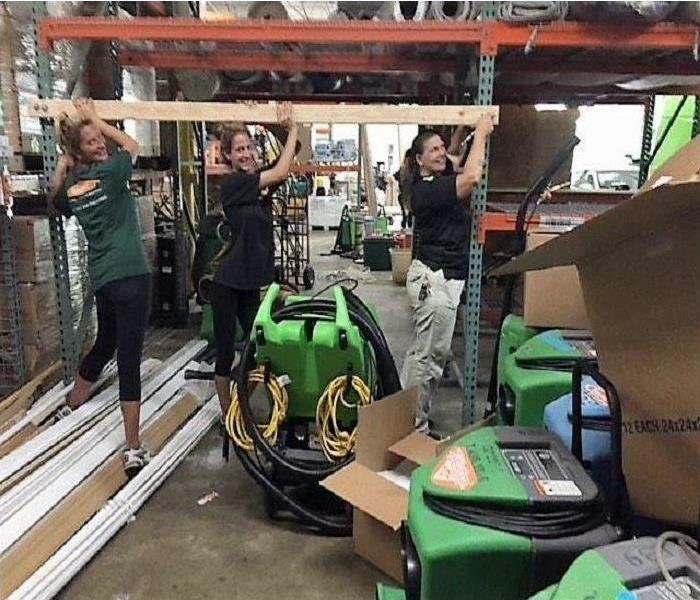 Here are a few of our girls rebuilding our shelving systems to accommodate more customers contents for storage. SERVPRO of Stone Mountain/Clarkston was called out to this church due to a water loss caused by a hot water heater. We used an Injectidry system to push air under the stage for drying. We were able to save the stage and keep business interruption low. This home suffered a water loss due to a pipe that burst. 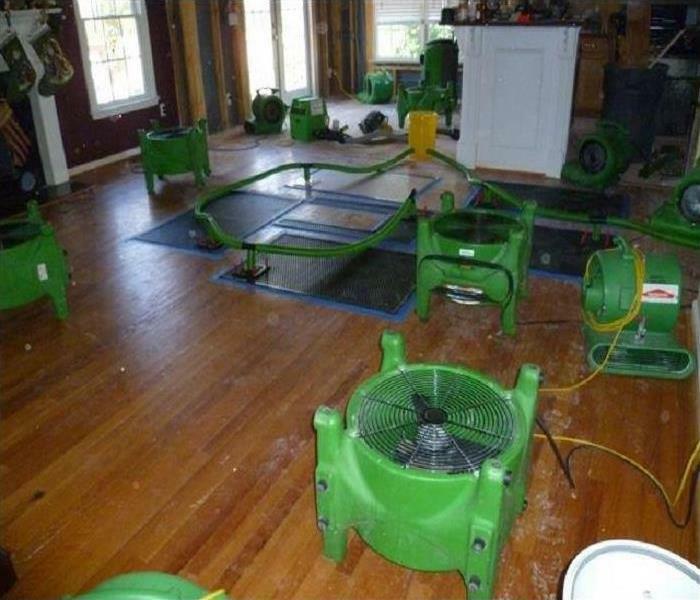 SERVPRO of Stone Mountain/Clarkston came out and set a mat system, fans and a dehumidifier. A mat system is used to help save hardwood floors by removing the water while helping the material back to its natural state. Sometimes, hardwoods have cupped or buckled beyond the ability to be saved. It is important that you contact us as soon as the loss happens to prevent continuing damage. 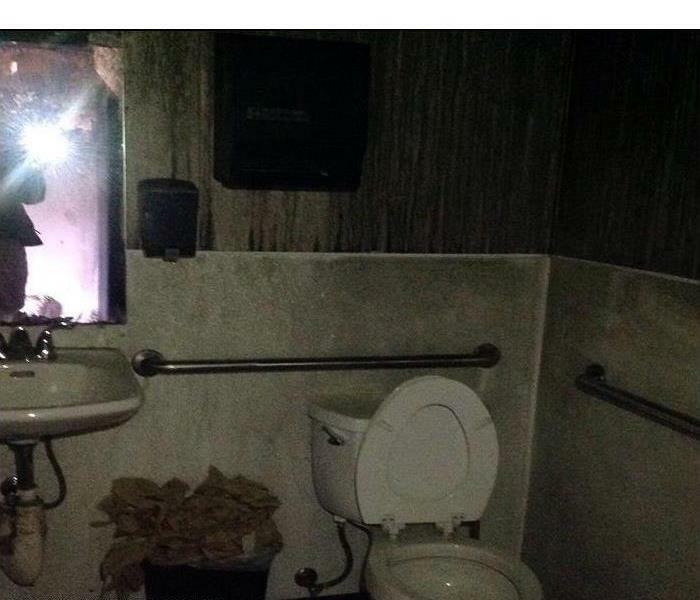 This was a fire loss in Atlanta, Georgia. It was caused by an electrical malfunction. 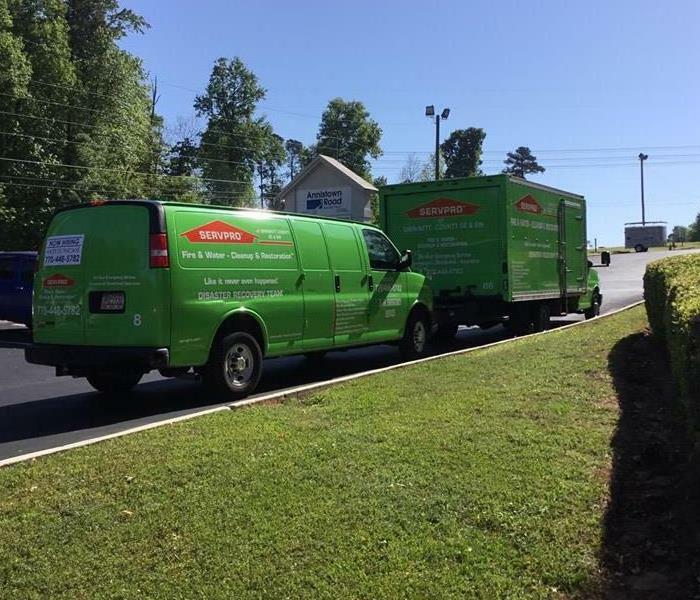 SERVPRO of Stone Mountain/Clarkston was called out to complete mitigation and clean the home of the soot that affected the surrounding rooms. This was a water loss in Lilburn, Georgia. A sprinkler broke and caused this loss. SERVPRO of Stone Mountain/Clarkston came out and during demo we located this pre-existing microbial growth. We were able to remediate it while completing the demo for water mitigation. 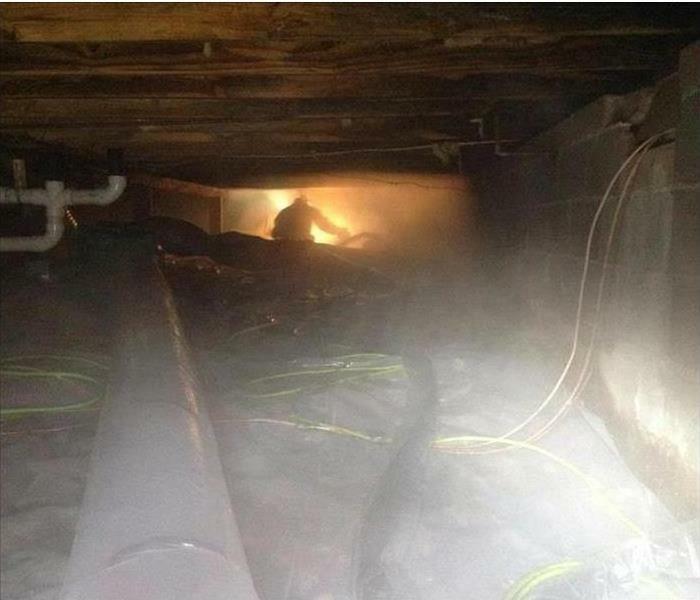 This picture is from a mold loss in Lilburn, GA. 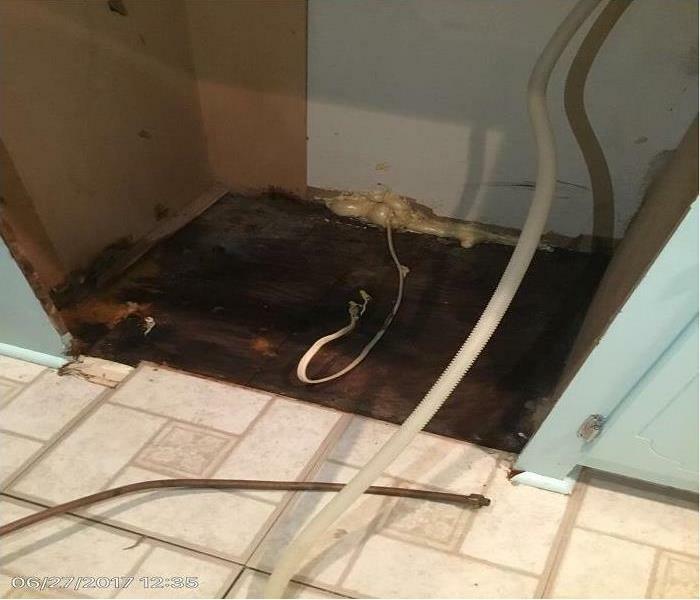 The cause of loss was from a dishwasher leak that had been ongoing for some time. The dark discoloration shows the extent of microbial growth found when we removed the dishwasher. 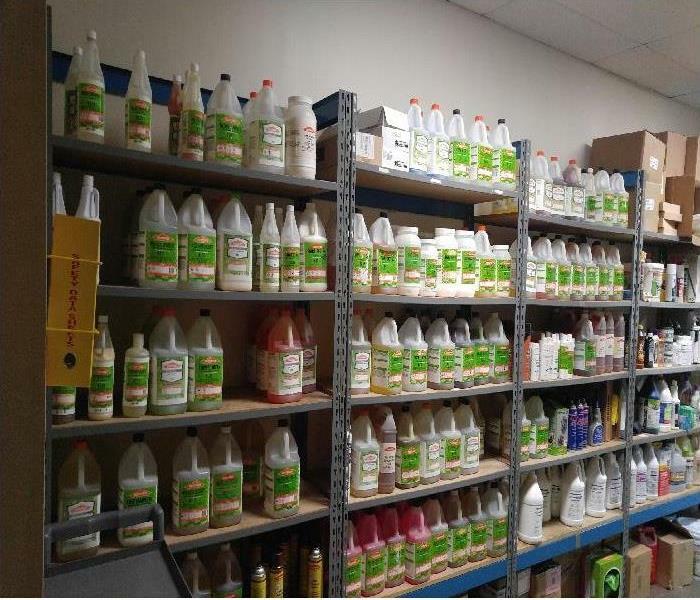 This is a picture of our supply room. 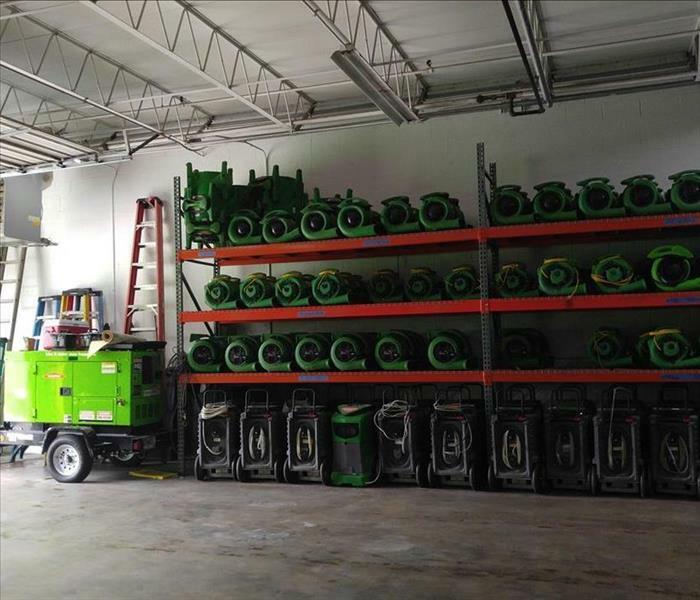 Each SERVPRO keeps supplies on hand for any job we may come across. These are mainly our chemicals we use on our jobs. 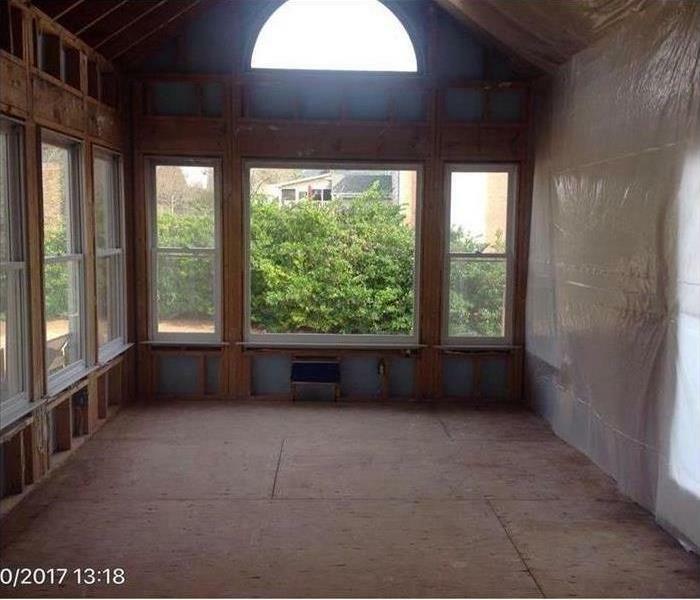 This fire loss in a home in Atlanta, GA. Due to the extent of damage caused by the fire and soot, we had to completely gut this room to complete mitigation. 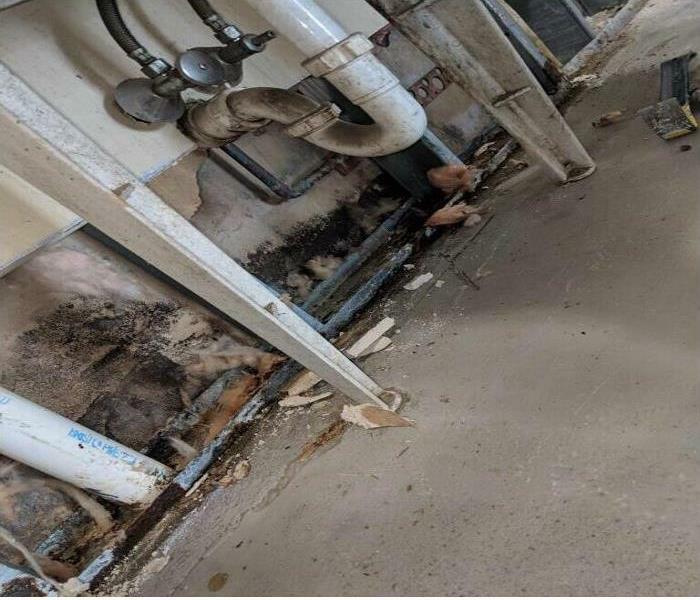 This water loss in a business in Buford, GA was caused by a broken pipe. We were able to dry this property in place with just equipment and no demo and get them back to business. 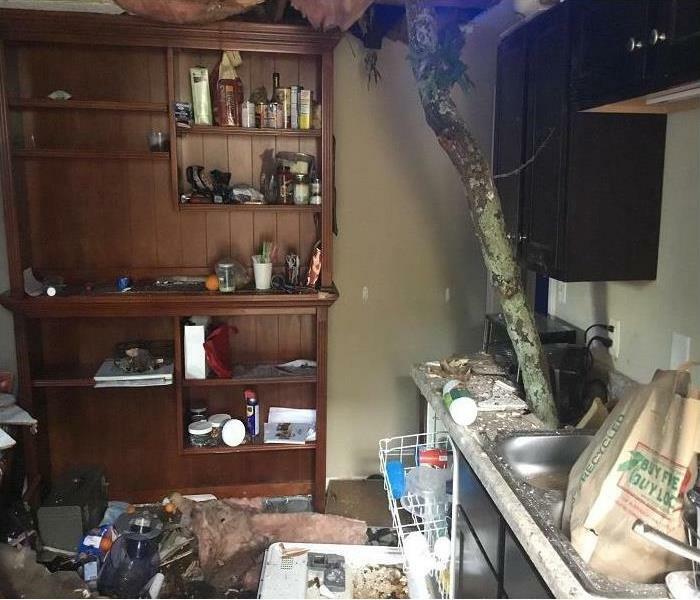 This is the kitchen of a home that had a huge tree fall on it in the recent storms here in Georgia. As you can see one of the limbs punctured the roof and went straight down into the kitchen cabinet. 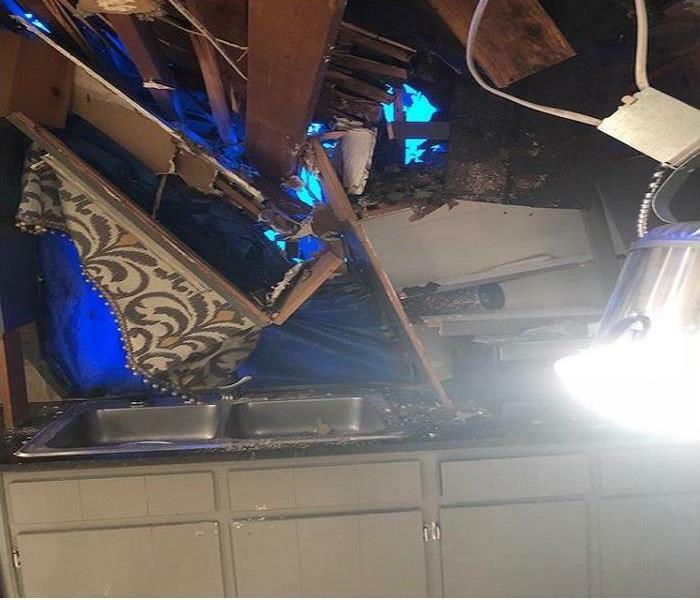 Fortunately, the tenants at this property were safe and unharmed when this happened. SERVPRO of Stone Mountain/Clarkston is helping the tenant retrieve her contents safely. 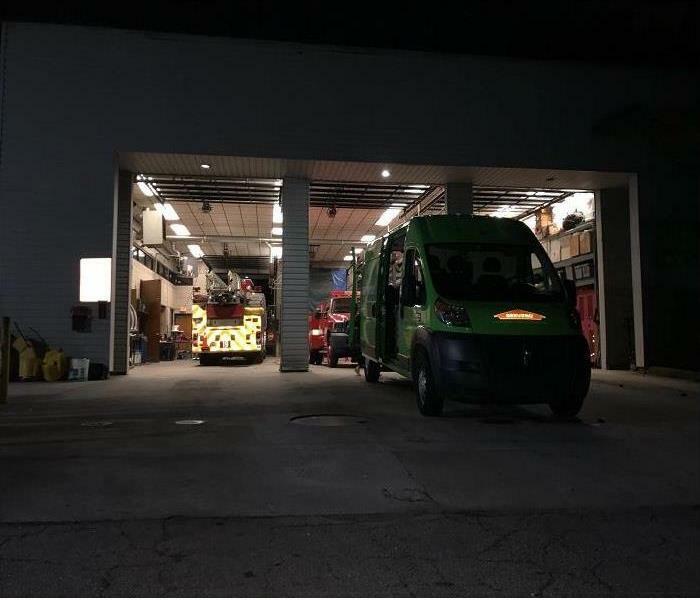 This firehouse in Atlanta, Georgia called SERVPRO of Stone Mountain/Clarkston out due to a water loss that happened in the building. Fortunately it was a small water loss and the business was able to continue as usual. 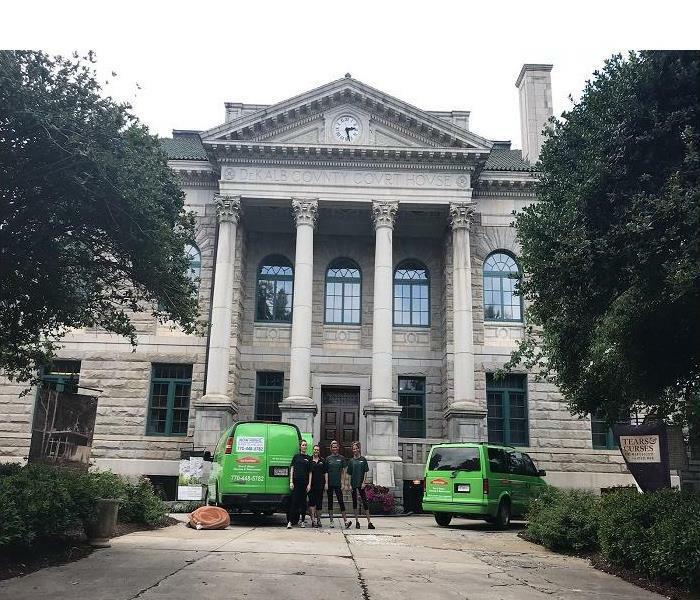 This commercial building in Decatur, Georgia called SERVPRO of Stone Mountain/Clarkston out due to a water loss that happened in the building. Our crews were quick to respond and keep them able to continue working. This home in Buford, GA was hit by a tree during a storm. The damage to the roof was extreme. 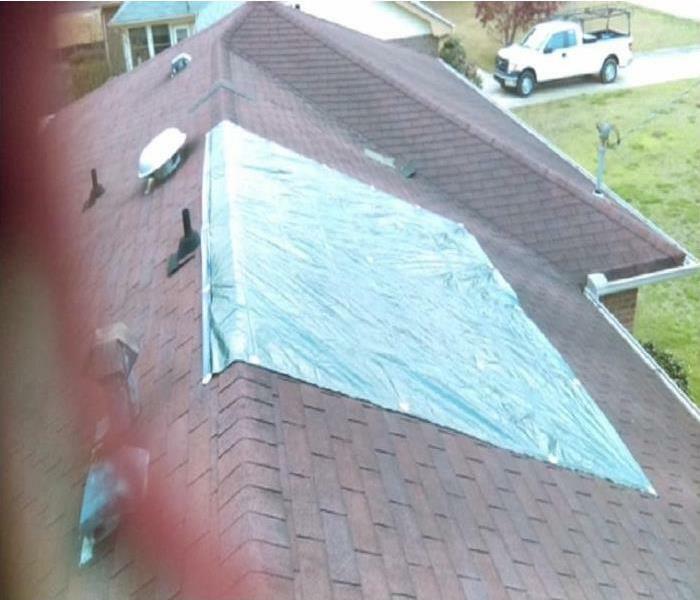 SERVPRO of Stone Mountain/Clarkston assisted the homeowner with getting a tarp put on the home and drying out the inside of home. 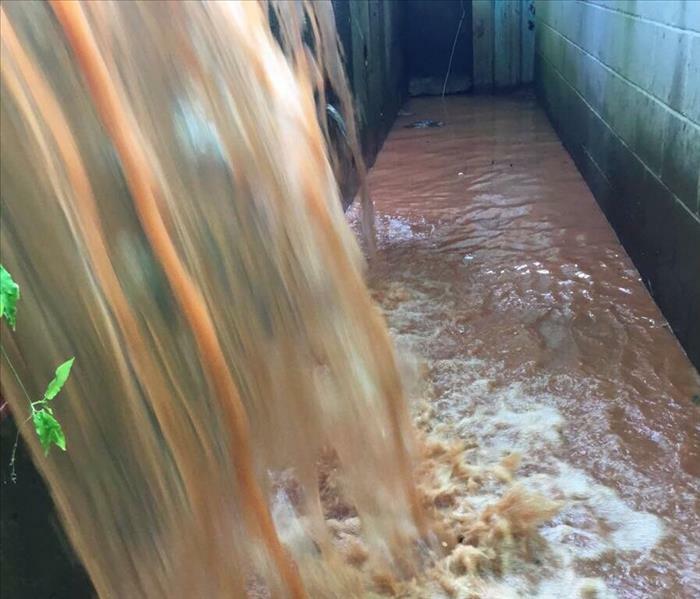 This business in Lithonia, GA was affected after a water main break caused a flood into their parking lot. You can see in the picture, the water is just coming over the fence into their lot at amazing speeds. 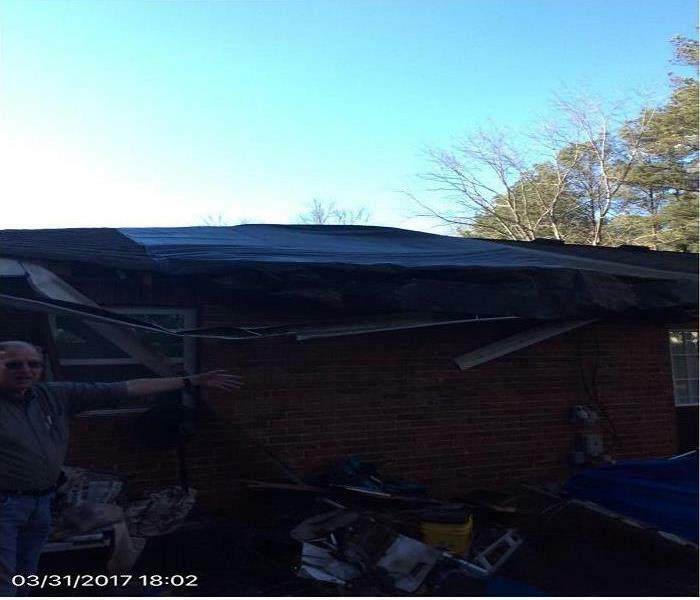 During the strong winds and storms that came through Georgia recently, this home was hit by a tree. As you can see the tree came straight through the roof and damaged the inside of the home. 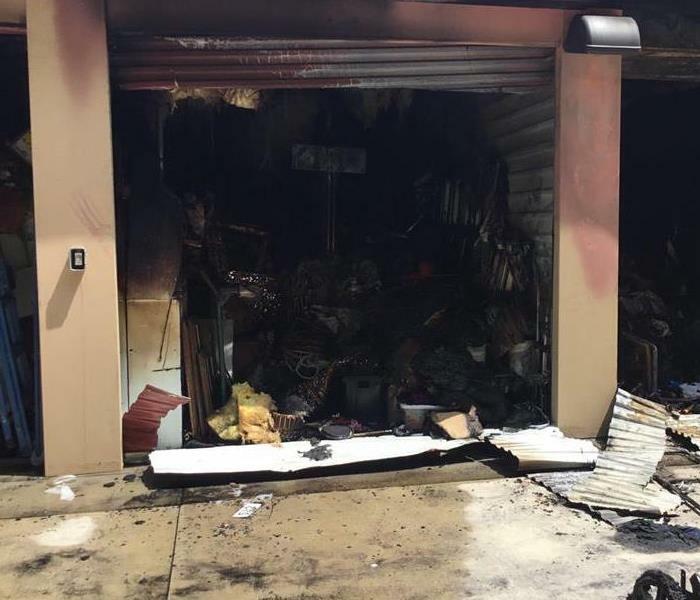 This fire loss at a home in Snellville, Ga was caused by an unknown source. 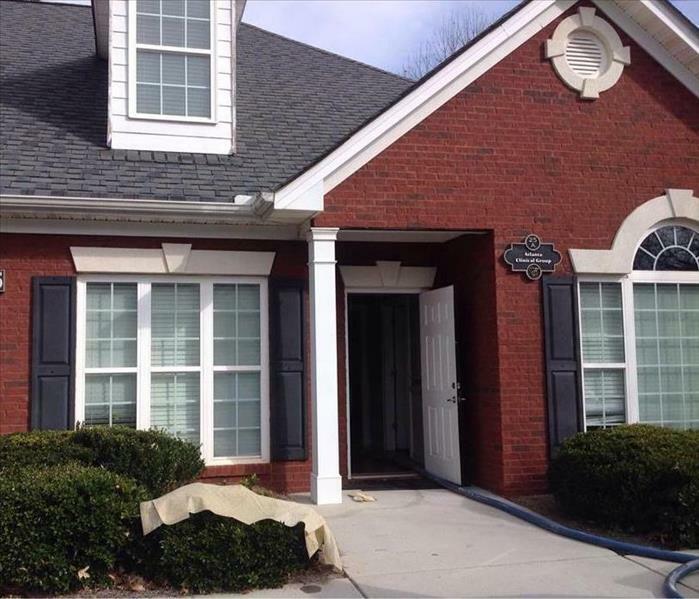 SERVPRO of Stone Mountain/Clarkston was called out by the insurance company to board up all ground level windows and doors so that the home was safe. 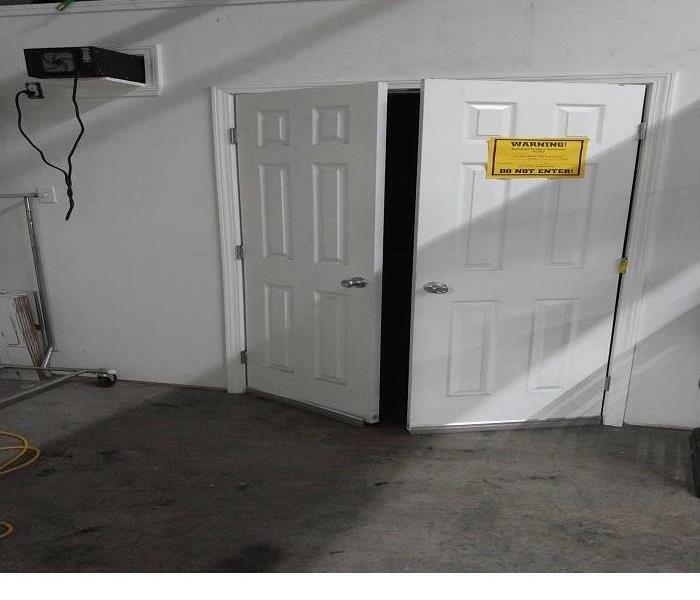 This fire loss at a storage facility in Stone Mountain, GA caused water and smoke damage through-out the facility. The owner called SERVPRO of Stone Mountain/Clarkston out to help assess the damage and remove any standing water that infiltrated the building. 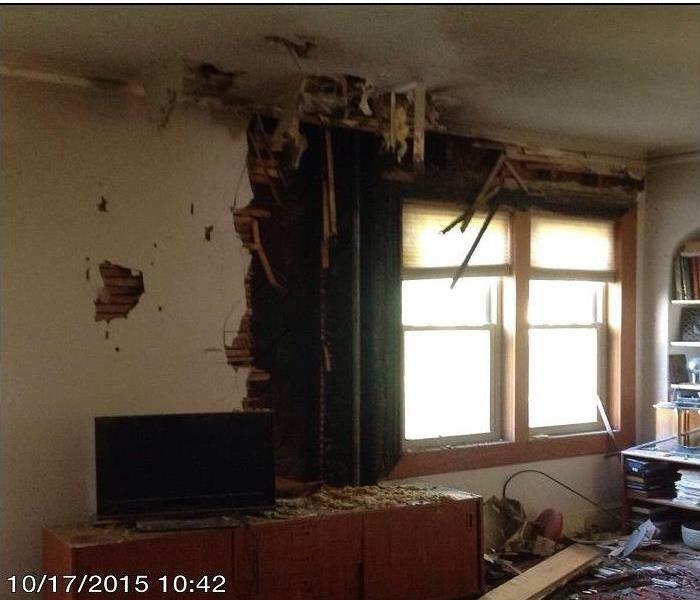 This loss in Stone Mountain, GA was caused by a fire. The homeowner didn’t know what caused the fire. SERVPRO of Stone Mountain/Clarkston was called out to board-up the window to make sure the home was secure while the insurance company was investigating the cause of loss. This home in Stone Mountain, GA was damaged during the last set of storms that came through. Shingles were blown off the house allowing water to come in. SERVPRO of Stone Mountain/Clarkston got the roof tarped before any extensive damage happened inside. SERVPRO of Stone Mountain/Clarkston sent some of our crew to get Lead Certified. During class they taught them how to put on proper Personal Protective Equipment (PPE). 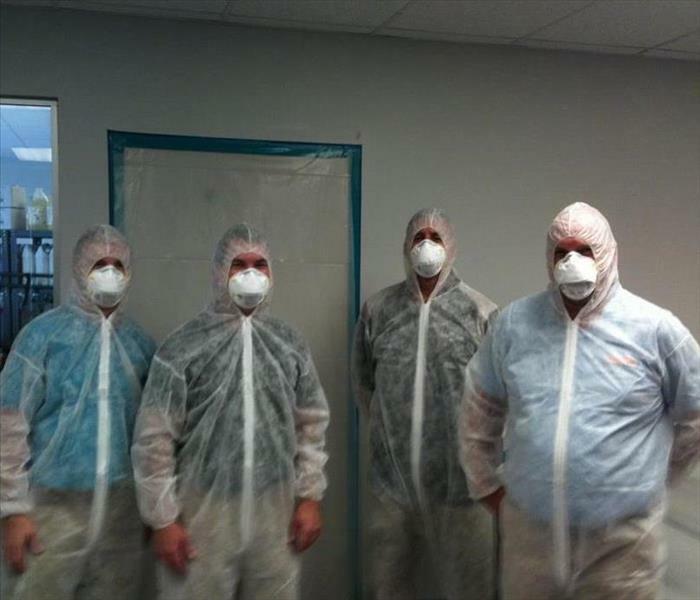 This should also be worn during mold remediation. We were lucky enough to be able to snap a picture of that. 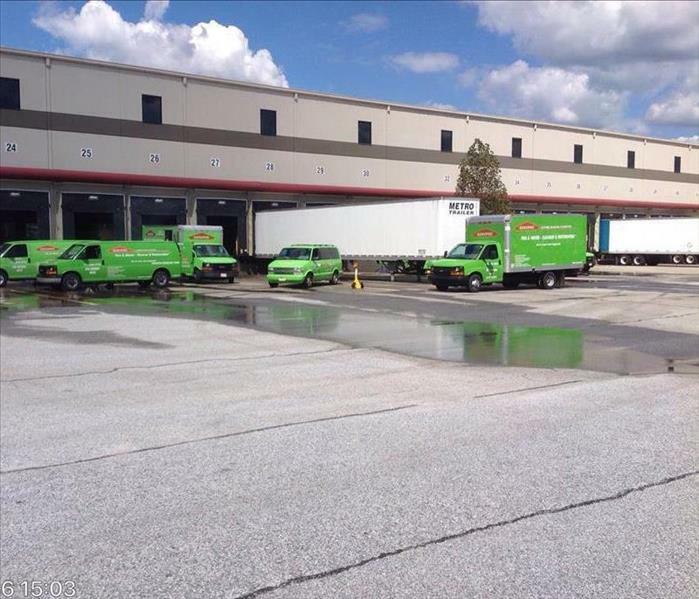 SERVPRO of Stone Mountain/Clarkston was called out due to a water loss at a local business. The lines you see running into the building are for our extraction. The lines are attached to a truck mount on our vehicle. 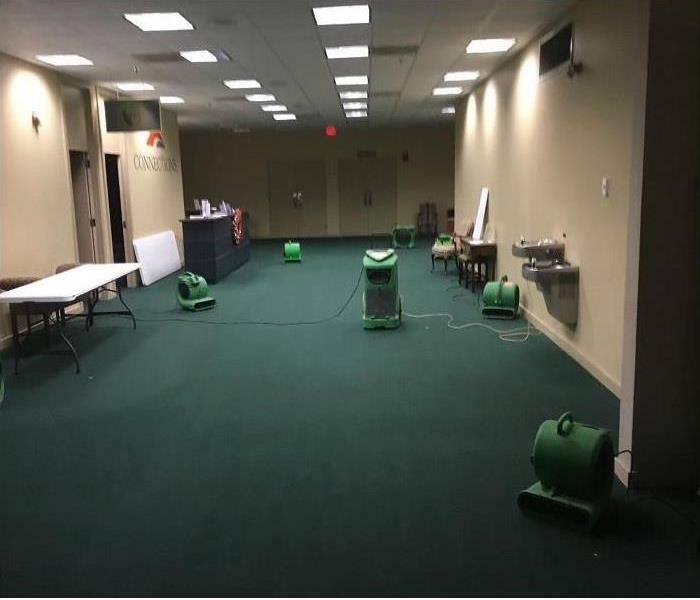 SERVPRO of Stone Mountain/Clarkston was called out due to a water loss at a local church. This church has trusted us in the past to complete mitigation in a timely and professional fashion. Our in house Ozone chamber is used for deodorization of hard surface furniture and contents that have suffered from smoke damage or other malodors. The Ozone generator produces Ozone gas by separating the two atoms of oxygen. When the Ozone gas comes into contact with an odor or gas, an extra molecule of oxygen is imparted and oxidation takes place. Ozone is a slow process that requires isolation of the area and then ventilation. SERVPRO of Stone Mountain/Clarkston is always ready for a water, mold or fire job. As you can see we keep our equipment neat and organized so that when a job comes, we are ready to go. Even in storm situations! SERVPRO of Stone Mountain/Clarkston hosted a CE (Continuing Education) class today. This class was about Understanding Mold in the Restoration Industry and was taught by Jon Minecci. This picture shows Mr. Minecci going through slides with our guests. SERVPRO of Stone Mountain/Clarkston makes sure our employees are always fitted with the correct Personal Protective Equipment or PPE. 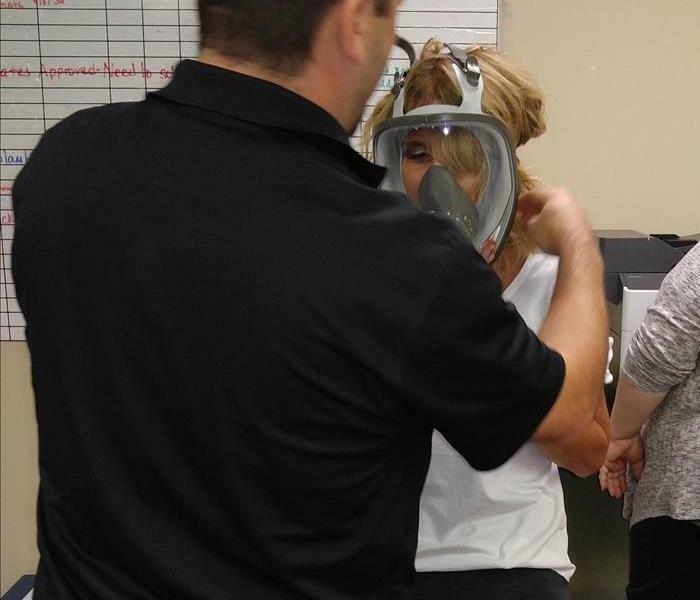 Here you will see one of our employees being shown how to put on a full face respirator. Mrs. Nancy Bell with SERVPRO of Stone Mountain/Clarkston goes to local schools and does story time with the kids. 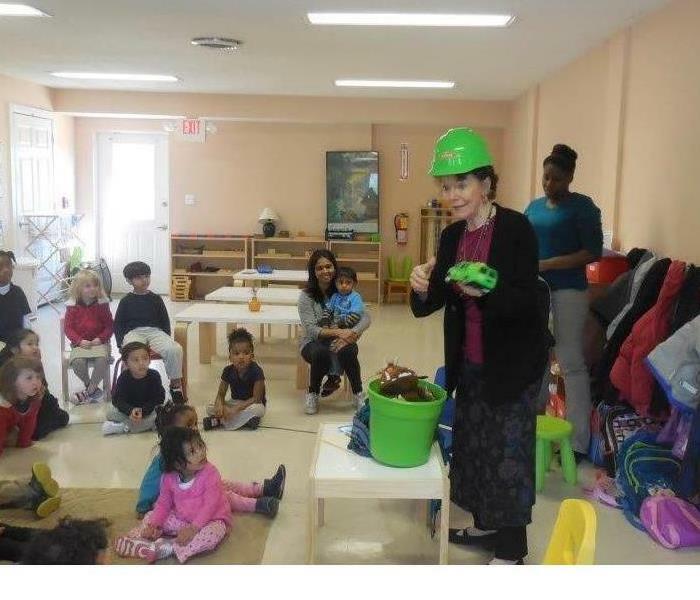 She puts on a SERVPRO hard hat and takes one of our toy trucks and tells a story about water mitigation. The kids love her! SERVPRO of Stone Mountain/Clarkston believes in giving back. 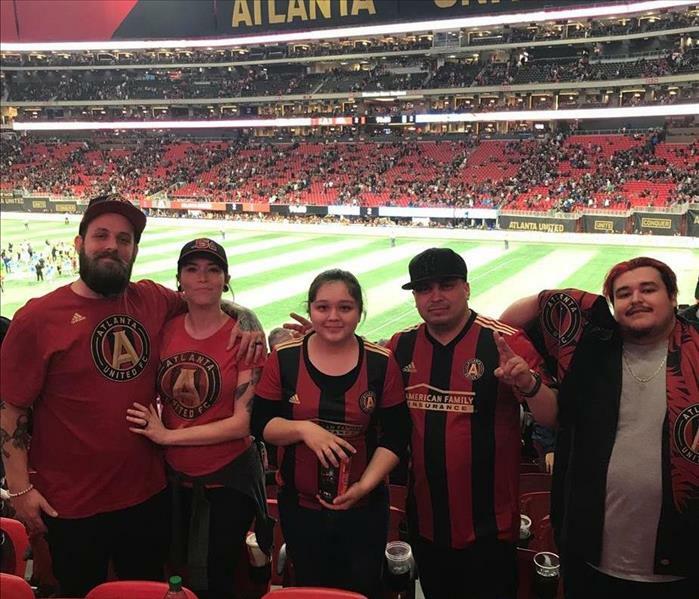 Our hard working technicians got a treat with a trip to an Atlanta United game. They loved the game and had a great time! 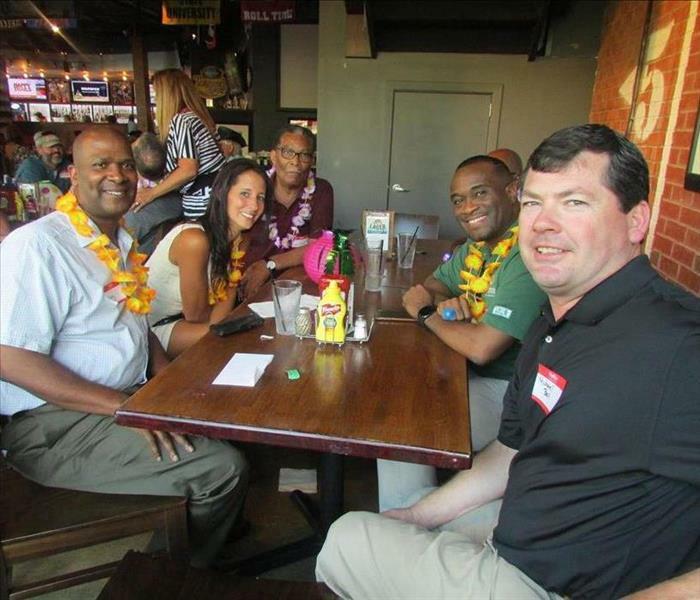 Every Spring and Winter, SERVPRO of Stone Mountain/Clarkston has a gathering for all of our agents that we market to. We provide dinner, drinks, games and prizes. These agents call us for water, mold, fire and bio-hazard jobs for their clients. We appreciate all that they do and we are glad to be able to give back. 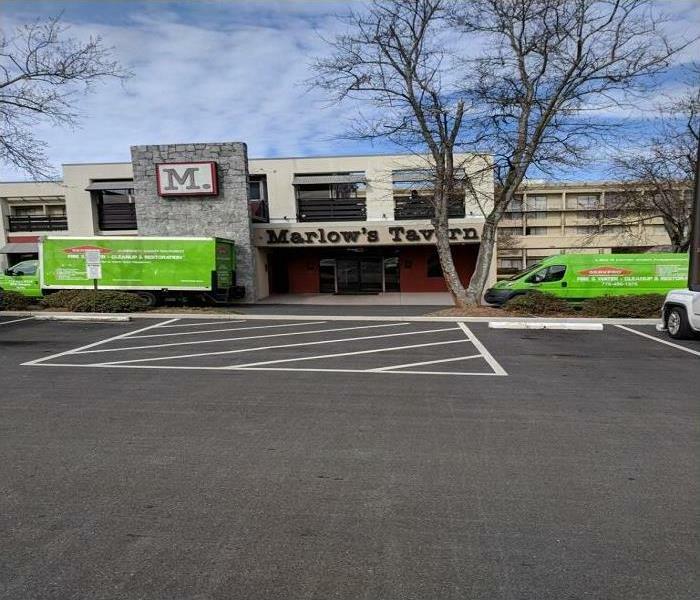 SERVPRO of Stone Mountain/Clarkston was called out to do a water extraction at a commercial building in Conyers, Georgia. Our picture shows all of our vehicles on site that were used to complete the extraction and get them back to business. In the month of May, our SERVPRO of Stone Mountain/Clarkston marketing representatives both celebrated their birthdays. 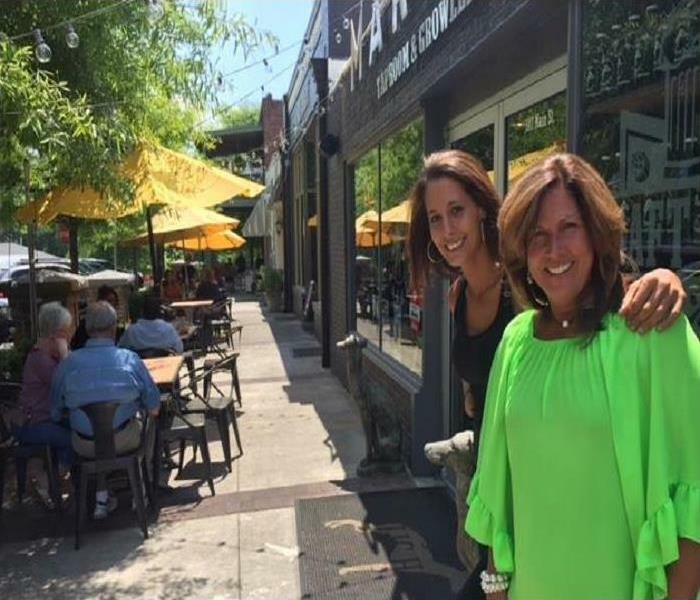 Toya Raney and Brittany Daniel are great marketing representatives and were taken to lunch on this beautiful day in Gwinnett County, Georgia. If you have a commercial business and would like an Emergency Readiness Plan for your company, these ladies would be glad to come out and provide that information free of charge. Call us at 770-496-1976. 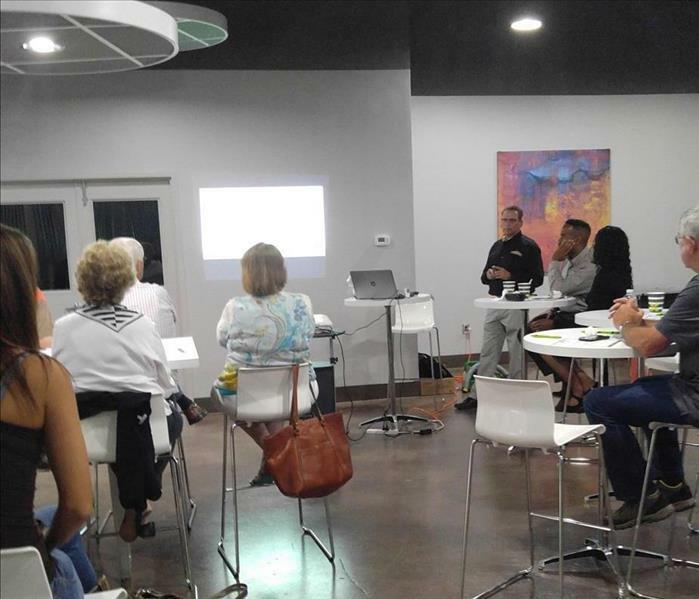 SERVPRO® is always continuing the education of their employees. Here is a picture from SERVPRO® Commercial Priority Response class on March 5th and 6th. 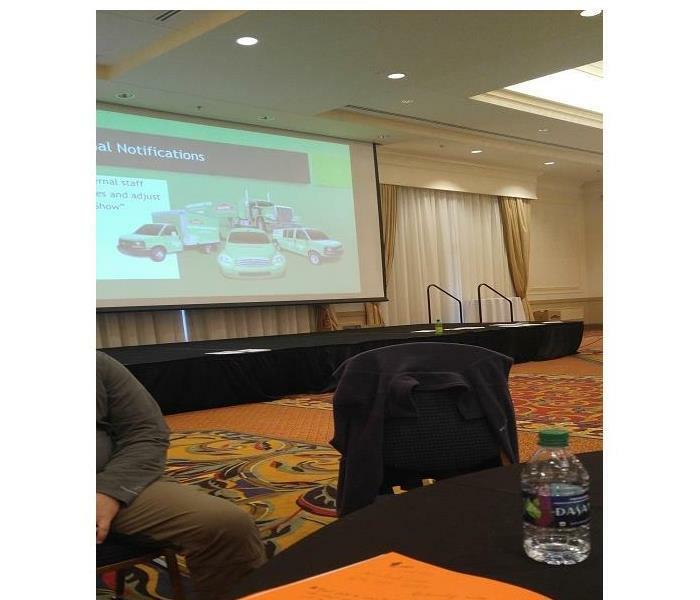 SERVPRO® of Stone Mountain/Clarkston attended! No matter what disaster strikes - Fire, Smoke, Water Damage, Flood, Burst Pipe, Mold - we are ready 24 hours a day, 7 days a week. We hold Georgia licenses for General Contracting, Asbestos Abatement and Pesticide (anti-microbial) use. Call SERVPRO® of Stone Mountain/Clarkston at 770-496-1976. We'll make it "Like it never even happened." There are several different kinds of media blasting that can be used to remove severe mold damage or soot damage to a building's structure. The two most popular are soda blasting and dry ice blasting. Both mediums have their own pros and cons and should be discussed with a professional before simply choosing one. We used dry ice blasting on the flooring joists of this home in Atlanta. We chose dry ice as our medium because of the easy clean-up, but also had to monitor oxygen and gas levels in the confined area. 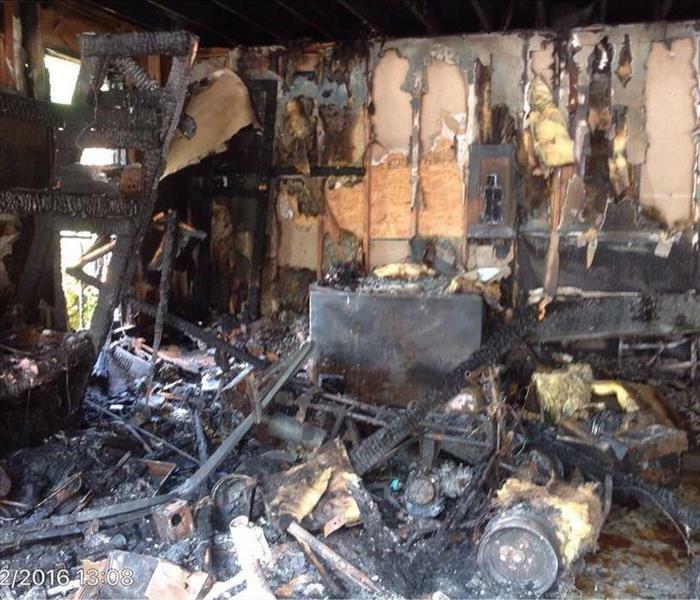 This home was damaged by a fire on their back porch. This sitting room was the closest to that area. It was damaged by fire and water from the fire department. SERVPRO® came in and removed all the affected materials and dried the structure. The customers were happy to see their home on it's way back to normal. Every summer our SERVPRO franchises offer a fun event which our area insurance agents and property managers enjoy. In fact, they can't wait to hear the music coming into their parking lots and our Marketing Representatives running into their office to announce, "The SERVPRO Ice Cream Truck is here"! Our area agents and office staff have said that this is one of the best marketing events that they have experienced. The smiles and childlike delight from everyone who looks at the pictures on the side of the truck in order to make a selection tells the whole story of what a hit this really is. 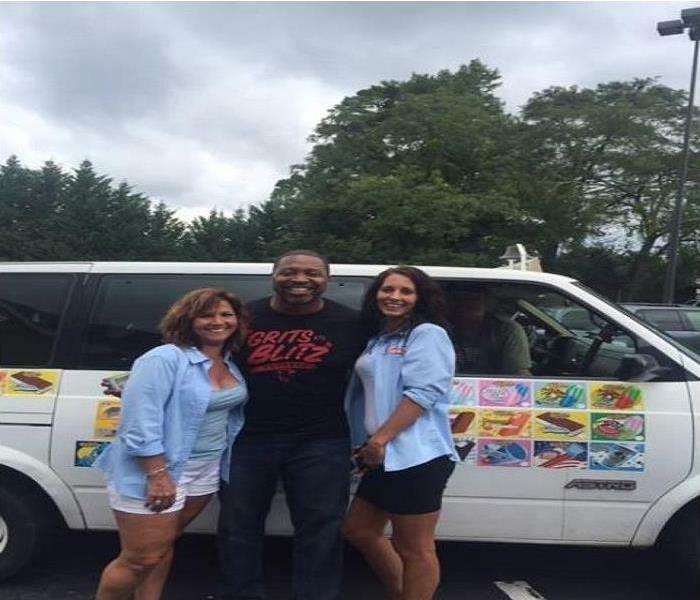 It took five days and 350 ice cream treats to hit our favorite offices in Snellville, Lawrenceville, Grayson, Lilburn, Dacula, Loganville, Tucker, Stone Mountain and Clarkston.